In the last week of WOVEMBER we received some amazing contributions which were just too good not to share which is why WOVEMBER will be continuing until Friday. This is therefore not the last post of WOVEMBER! Though the month has run out of days there was just too much good content for us to either turn down or attempt to cram into a handful of days. This evening for 30th WOVEMBER we welcome back Sally Antill with the third part of her series on the unique Soft Fell sheep flock that she and her partner, Michael Baxter, breed in Cumbria. For my last post this Wovember, I thought it would be interesting to look at the logistics and finances of a commercial (meat sheep) farm making fleeces available for hand-spinning. By shearing-time, we generally have between 240 and 280 adult sheep to clip. About 30 of these will be the hoggs, that is ewe lambs born the previous year, who will enter the breeding flock in the coming autumn and who have not yet been clipped at all. We clip the hoggs first, usually around the end of May but sometimes earlier, depending on the weather and when their fleeces are ready. With that size of a group, we get just one shearer, so sorting out nice fleeces as he clips isn’t such a problem. When we move onto clipping the rest of the flock, it is two or three madly busy frenetic days and it is not practical to keep every individual fleece back for further assessment. It’s usually about a month later that the rest of the flock is ready. When we do the rest of the flock, this is how it goes. We’ll get two shearers, each of whom will take around 2 minutes to clip a sheep. So there are fleeces coming off the platform at a rate of one a minute. We’ll generally do the bulk, maybe 2/3 of the flock on one day, and the other smaller lot on the second. So with around 250 sheep to clip, we probably have around 150 fleeces to handle on one day and 100 or so on the next. The shearers are paid per sheep, and have all their customers clamouring at once to get their sheep clipped. So quite understandably, they want to get the job done as quickly as possible, get packed up and on to the next farm. Sheep about to be clipped get ‘shedded’ off from their lambs; it’s dangerous for lambs in the clipping pens and race, so it’s better to keep them separate until their mums are clipped. We shed in the pens, so each group about to be clipped goes through the pens to be shedded, the ewes go down to the clipping area and the lambs get any attention they need – usually a worm dose. Once the clipping holding pen is full of sheep, one sheep is chased up to the end of the clippers’ race, and held in a neck lock. Seeing another sheep’s bottom up there attracts the other sheep to trot up the ramp and along the race, from where the clippers can fetch one out through a sliding door when they are ready for their next customer. The loader’s job is to keep that race full of sheep, so there is always one there for the clippers to fetch out. A good loader gets the sheep moving up there of their own free will, rather than having to manhandle or chase them up, so that they are calm and settled when the shearers get them. A calm sheep is much easier to clip. On the other side of the shearers’ platform, the wrapping team await. As each shearer finishes a fleece, a wrapper needs to remove it from under his feet so he can get on with his next customer. Without the complication of selecting fleeces for hand-spinners, the wrapper would then throw the fleece onto a clean surface, cut side down for our kind of sheep (hill sheep’s fleeces are wrapped outside-out, all others are wrapped with the cut side out), and skirt off any truly dreadful daggings. Then wrap the fleece for the Wool Board, which is starting at the back end, fold the sides in and roll – tightly, like a sleeping bag – up to the shoulders. Then make a rope of the neck wool by twisting it, and bring that around the roll, find a natural hole in the fleece and stuff the end of the neck rope in there, to make a secure, tight bundle. The bundle is put in the ‘sheet’ (humongous sack the size of a super-king size luxury thickness bed.) When the sheet is full, it is stitched up and a new sheet is put in the frame which holds it open to catch the fleeces. We get around 30 of our fleeces in one sheet; on the moorland farm we used to get about 50 Swaledale fleeces in a sack. The wrapper will have to get into the sheet and tread the fleeces down at least twice before it’s full – rather like treading grapes! With two shearers, it is barely possible for even a very fast wrapper to keep pace. However, with batches of 20-30, they have a breather to catch up a bit as a new batch is brought down and penned, and the race filled ready to start again. If we have only one wrapper, our only way of selecting fleeces for hand-spinners is for the loader (usually me), the shearer or the wrapper to identify in just a few seconds as that sheep or fleece goes by that it may be a nice one. Our No. 1 shearer is getting pretty good at this now; I rarely reject one that he has picked. However, he doesn’t (yet) spot all the ones that will be nice. And his co-shearer is just beginning to develop a feel for it himself. We are grateful to have shearers who are interested in fleece, and find this whole hand-spinning malarkey interesting, and so are willing to take a bit of time to learn what we are looking for, and also a little bit of extra time and care when clipping when they know it will be a hand-spinner’s fleece. It was in a way harder this year as actually most of the fleeces could have been candidates. And there is no way it is practical to make heaps of all of the fleeces and go through them one by one later – although that option is one that I will explore for future years. Some sheep clearly have good fleeces, and yes, could be identified earlier in the season. However… how to mark them? Not any kind of ear tag; tagging their ears in summer just begs for the flies to bother them. And spinners don’t like marks on the fleece! Paints don’t persist on non-wooled areas like heads or legs. Some fleeces look good on the sheep, but when you have the cut face in front of you, it’s not so nice. Or it looks and feels nice, but when you test a lock it has a weakness. Or when you draw some fibres apart – pre-drafting – they are grabby and don’t want to part. Some sheep gave lovely fleeces last year, but this year their fleece is not so nice. And some really nice fleeces come off sheep you don’t expect. I kept two from the moorland-bred Beltex x Mules this time – I only know they are from those sheep because I made a note at the time; in a pile of fleeces I wouldn’t be able to tell them apart from most of the 3rd generation home bred fleeces. Have I not noticed that they had nice fleeces in previous years? Or are their fleeces just particularly nice this year for some reason? I don’t know! So, when a fleece is identified as a potential for hand-spinning, then the wrapper throws it on the pile to be sorted through later. If I am on the wrapping side and there is anything identifiable about the sheep, I pop a note on top of the fleece. For instance ‘moorland Beltex’, ‘Charlie1’, ‘mad ewe’, ‘DT x’ (Dutch Texel x). If I am loading, or fetching and taking sheep, then there are no notes, of course. One thing I shall try to introduce for next year is a pile of old cotton sheets to put between each fleece. The fleeces can be so cobweb-like that it can be tricky to piece together just the next fleece to take it off the pile to have a proper look at. An alternative is to roll the fleeces, but loosely, so that each is completely separate. However, again with the fleeces being so cobwebby, there is a limit to how many times you can roll and unroll a fleece before it starts to lose cohesion. For non-hand-spinning readers, it is probably as well to explain that the lace-curtain cobwebby type fleece is the most appealing for hand-spinning. The fact that the fibres are falling away from each other clearly indicates that fibres will ‘draft’ well, that is, they will glide readily over each other as the spinner’s fingers draw them out into yarn. It is helpful, however, if the fleece remains ‘sheep-shaped’ as you start to process it, so that the tips (dirty, weathered ends) and butts (cut, clean ends) are correctly oriented, and so that the harsher fibres will broadly be found around the rear end (where she has turned her back to the wind and rain) and the better, softer fibres around the shoulders and neck. As is clear from the above, in order to select out potential fleeces for hand-spinners on clipping day, we need extra labour. Thereafter, a second assessment will reduce the piles as fleeces with too much paint or dirt, or fleeces with weak fibres or too much felting are removed. Those making the grade are then skirted (unspinnable fleece removed; industrial processing can clean up fleece that a hand-spinner cannot, so additional fibre is removed when the fleece is destined for hand-spinning.) From the start of this second assessment, it takes an average of 15 minutes per retained fleece to grade, select, skirt, roll, bag and label the fleeces that are suitable for hand-spinning. Our sheep have nice fleece, and we generally get an average of around £3.50 per fleece from the Wool Board. Michael points out that it is the better fleeces I am removing for spinning, so they would fetch above that average if they went to the Wool Board. I hasten to add that we don’t in any way resent the time and effort to make our fleeces available to hand-spinners. We, like many farmers, love to know our fleeces are nice to spin, and love to see them used and giving pleasure. 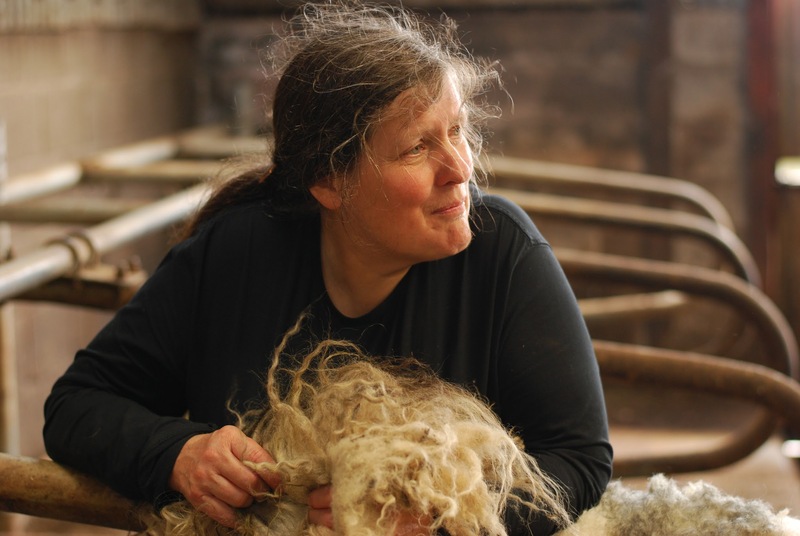 Team WOVEMBER would like to extend huge, warm thanks to Sally for her contributions about the Soft Fell breed. It had been fascinating to learn about the breed, it’s genesis, evolution, the care and maintenance of it and it’s wondrous wool. Text content © Sally Antill; high resolution photos © Neil Worthington and used with kind permission.